In Tabletop Defense, players have to strategically place their towers along the enemy supply lines to stop the invasion of their kitchen table. In order to stop the advancing ground and air units, players start off with a small budget to purchase and upgrade their towers. 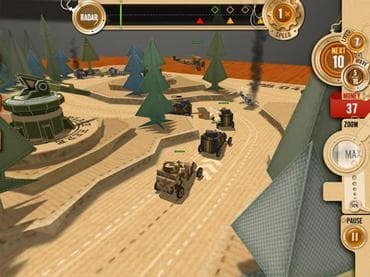 As the levels progress and more enemies are vanquished, the players will earn extra funds; but it's up to them to make the right decisions about which towers to place where and which upgrades to purchase in order to stop the ever more challenging waves of armored buggies, tanks and planes. Download free full version game and get ready for some of the most intense battles! Free Game features: - 24 addictive levels with two difficulty levels: normal and expert ; - 5 different turret types, with 3 upgrades each; - 7 enemy types, with 3 sub-types each; - True 3D environment in each level; - Turret and air view with different zoom options; - Different game modes for different types of players; - Game speed controls for adjusting the intensity of action. If you have questions about Tabletop Defense game, please contact us using this form.